Let’s play an analogy game: _______ is to my wife as Star Wars is to me. If your answer was either superheroes or Superman, then you won the game. Congrats! With that in mind, it should come as no surprise to you that the recent theatrical release of Man of Steel had my wife in a tizzy. In order to celebrate, she took a day off work and had herself a themed outing for her favorite muscle-bound boyscout. We bought IMAX tickets, got in an early run at a local park (while listening to and humming the John Williams theme from Superman the Movie, no less), and then headed to Supper Heroes in Huntsville, AL, the most wonderfully geektastic restaurant you can imagine. 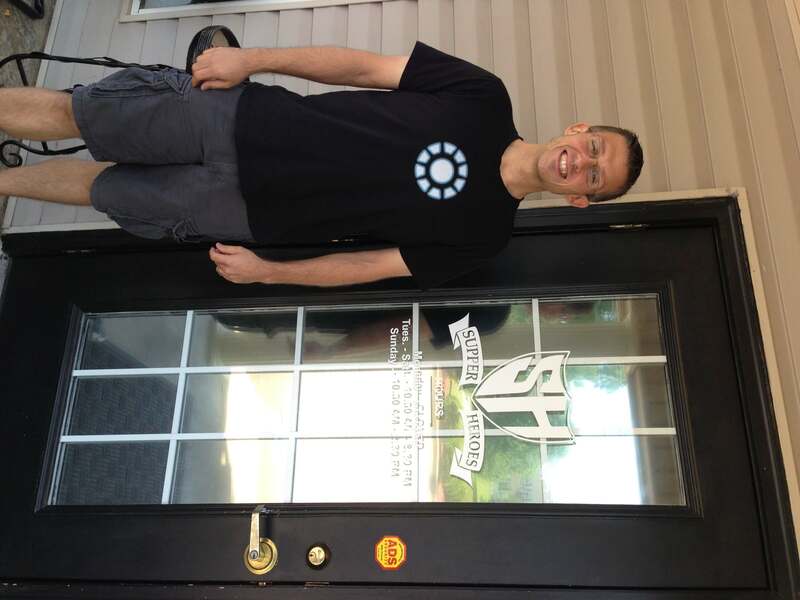 We walk in the door, and I immediately start to smile. There are superhero posters everywhere, decoupage tabletops made from comic book panels, hero-logos painted onto the light fixtures, Silver Age comics as wall decorations, and even the menus are printed as pulpy dot-matrix throwbacks. In other words, we were in geek heaven. Keep in mind, though, this was a pre-planned cheat day. We knew going in that this restaurant isn’t full of health foods. You won’t find organic sprouted breads, kale and quinoa salads, or even turkey burgers. And you’re going to love every bite of it. After having a good run that morning and skipping lunch in order to eat at Supper Heroes, we were pretty much starving when we arrived. Which was a good thing. We didn’t bother ordering an appetizer because our meals were going to be so extravagantly decadent: I ordered the Used Car Salesman (a traditional cheeseburger with all the fixins) and my wife ordered the Luchadore (a taco-style burger with guacamole, pico, and all that yummy spicy goodness). Both orders came with waffles fries and coleslaw. 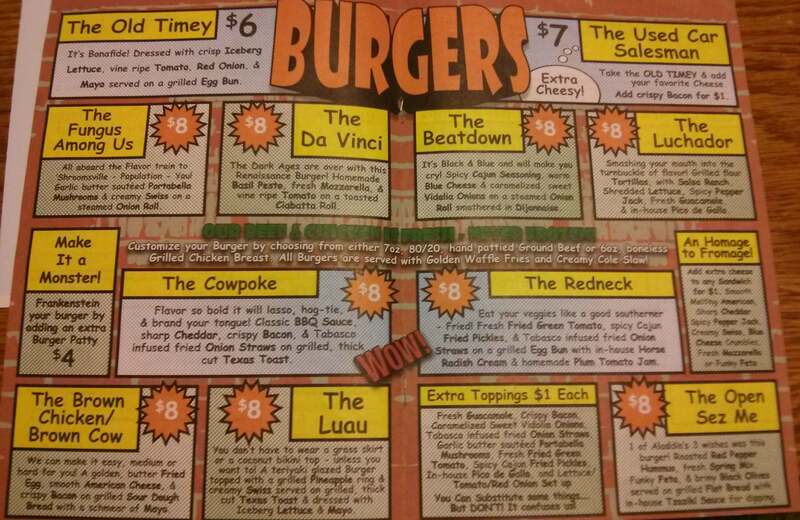 The fries were excellent, and I was horribly tempted to order a second serving, the coleslaw was good, but neither of us are slaw people, so it was left largely uneaten, an the main courses–the gigantic, honkin’ burgers–were as delectable as any I’ve had. For what it’s worth, my burger was better than any I’ve ever had at Five Guys, and I think those are primo. Jennifer adored hers, too, and she commented on how cool it was that the burger was split in half and served in two tortillas, like a taco. She noted that it was spicy enough to be flavorful, but never too hot to eat and make her want to gulp down a fire-extinguisher–which is exactly where a burger called The Luchadore should sit. And even though we didn’t try it, there is a daily flavor of Kool-aid on the menu. Seriously. Who didn’t grow up with Batman: The Animated Series and a glass of grape Kool-aid after school? Talk about a throwback. My wife was so excited to see Kool-aid on the menu that next time we go (and I can guarantee that there will be a next time), we will definitely be snagging that nomtastic delight, despite the sugar. The staff was great, too. Our waitress not only kept a good eye on our food and drink, but she also took particular pride in the comic collection on the walls, told us how she had decoupaged a particular tabletop with the theme of “intensity,” and let us know that she was the one who painted the logos and symbols on the lights above our heads. 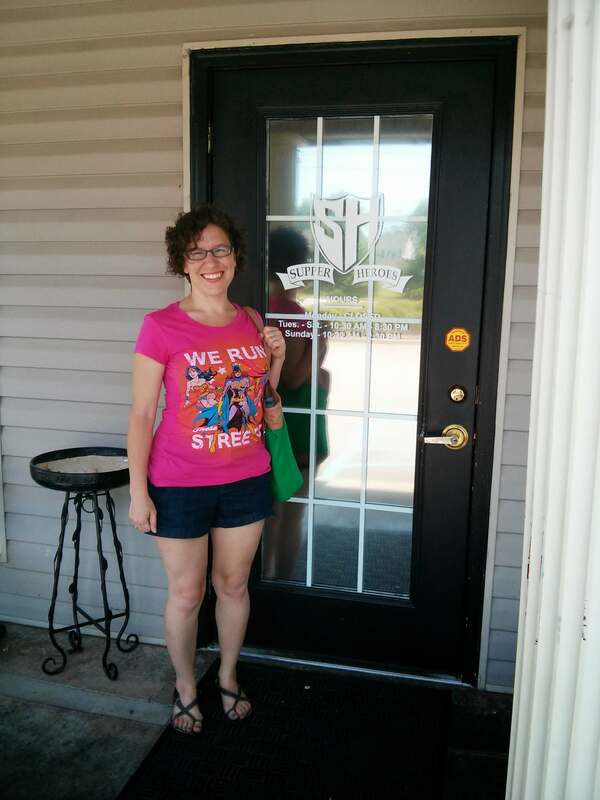 After we were finished, she gave us a tour of the place, including the Batman-themed waiting area–that she affectionately called the Batcave–they use when the restaurant is busy. It was awesome. Probably the best part, though, was that the 1980s The Incredible Hulk was playing on the TV behind us. I immediately recognized the episode as the one where Thor shows up, and I made sure that my wife watched as the Norse god was summoned through some wonderfully cheesy lightning effects. I mean, I remember watching that particular episode over and over again on an old, dubbed VHS tape when I was a kid. It was my favorite of the whole seres. Seeing it on the TV in Supper Heroes was a real treat I never could have anticipated. If it isn’t completely obvious, we’re enamored with Supper Heroes. I’m so happy that geek culture is becoming so prevalent that a restaurant like this can thrive, even in a stereotypically non-geeky region like the South (though to be fair, Huntsville is a pretty hoppin’ geek/tech center). 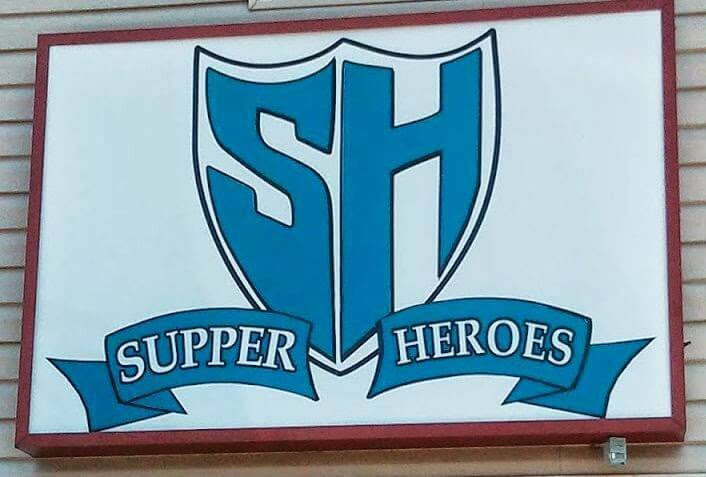 I know that the next time we’re planning a cheat day where we have fun while splurging on really good food without worrying about calories, it will probably be at Supper Heroes. 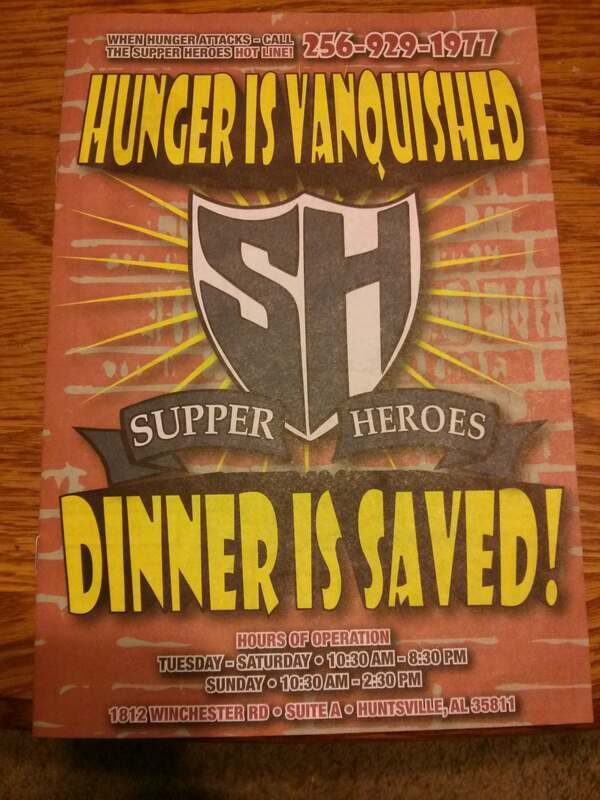 And in all honesty, I can almost guarantee that the atmosphere that the restaurant promotes has made it so that Huntsville will become our go-to city for superhero movies. Huntsville is the one place I almost kinda sorta miss in Alabama. If I ever get a chance to go back, I’ll check this place out. Sounds like a blast!